Stay Staffed® * and Candidate Direct® ** proprietary workforce management solutions are easy to implement and result in cost savings in just one month. Cases studies involving hospitals with staffs from 200 to 2000 reveal a significant increase in fill rates whenallowing management to post open shifts online and internal staff theconvenience of filling them 24.7 / 365 days a year. Not only that, when coupled with Candidate Direct workforce management solutions, providers build and manage their own contingent workforce, reducing and eliminating agency reliance and costs. Thank goodness for traveling healthcare professionals and per diem nurses, therapists and locum tenens. 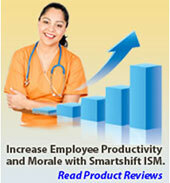 But research shows that most healthcare providers would ideally like to fill open shifts with existing staff. Why? Because internal staff are familiar with the surroundings, the patients and their coworkers; they can float and are fully-trained on the scope of your technologies. Most importantly, internal staff cost less than temporary staff and patient care is never compromised. If your goal is to manage your own workforce and reduce or eliminate third-party staffing costs, then you may want to do what one of our community hospital clients in the Midwest did. As an alternative to integrating their in-house core scheduling package with a costly open shift scheduling software component, they called on Stay Staffed to supply them with a low-cost feature rich staffing solution – updated in real time – to fully automate scheduling and optimize internal resources. You'll be impressed with how our hosted workforce management solutions deliver high ROI in just a short period of time. Let us show you in 30 minutes or less how we can save you thousands of dollars by maximizing your internal resources, managing multiple vendor environments and building a contingent workforce you can count on day in and day out. Call 800-585-1710 today to speak to a member of our executive team. **Candidate Direct is a proprietary Stay Staffed web-based workforce management solution customized to manage multiple vendor environments and build and manage a contingent workforce of any size.